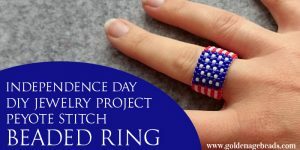 This project is great for beginners as there are just a few basic jewelry-making techniques involved, such as bead stringing and using jewelry pliers. 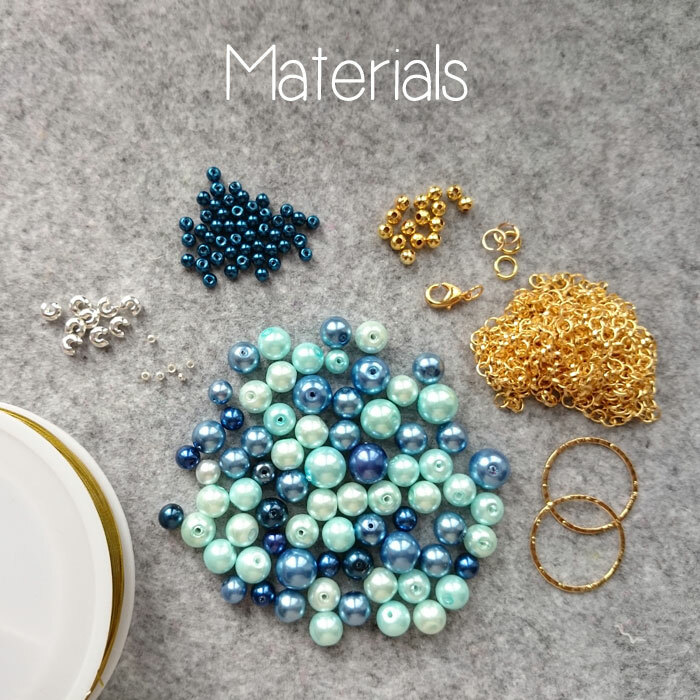 A mixed selection of round beads such as shell pearls in 4 different sizes and colors. 18 x round gold spacer beads. 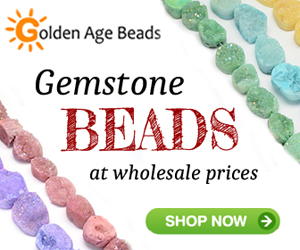 6 x crimp beads in silver or gold tone. 6 x crimp covers in silver or gold tone. 2 x gold tone hammered linking rings. 4 x gold tone jump rings. Soft Flex beading wire in 0.19 Bone or 0.14 Bronze. Jewelry pliers and wire cutters. Optional – bead design board. 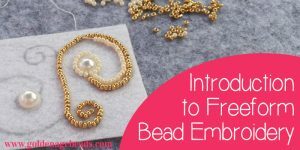 To begin, lay out a pattern of beads in three different strands. If you have a bead design board, you can use this, but don’t worry if not. 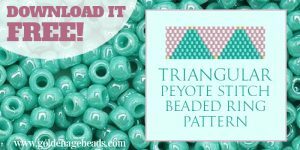 You can just lay them out in rows on your beading mat. 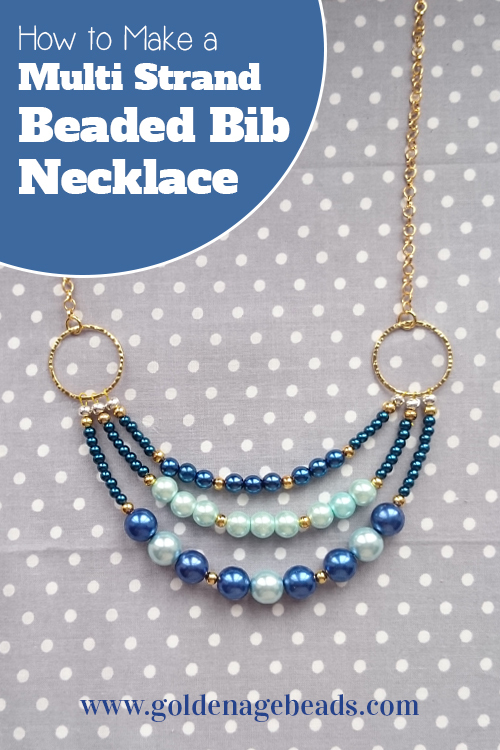 If you’re using a beading mat, be sure to curve your rows of beads upwards as you’ll want the strands to drape nicely when this necklace is complete. 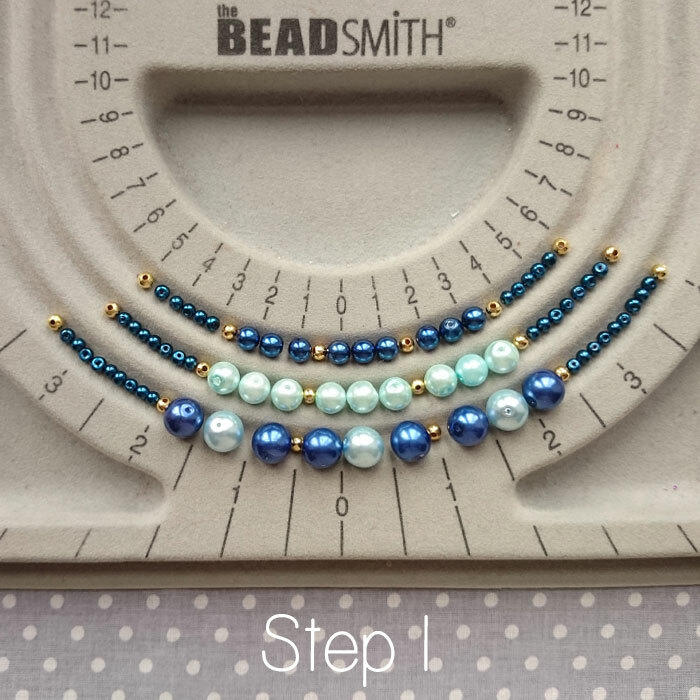 Use your larger beads for a central pattern on the bottom strand, followed by slightly smaller beads in the middle, and the third smallest ones at the top. 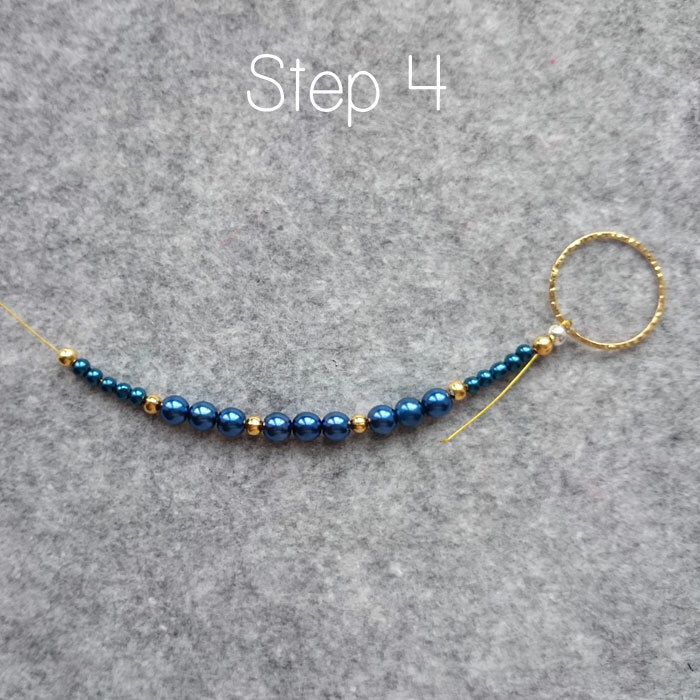 Use your fourth smallest beads to extend each of the strands at both sides. Separate your pattern as shown in the photo with your gold spacer beads. Take some time to play around with your pattern to make sure you’re completely happy with it before moving onto the next step! Cover your crimp bead with a crimp cover to make it look nice and tidy! When closing the crimp cover over the crimp bead, take care not to grasp the loop that you’ve made with the beading wire. Doing this will cause your hammered link to twist! 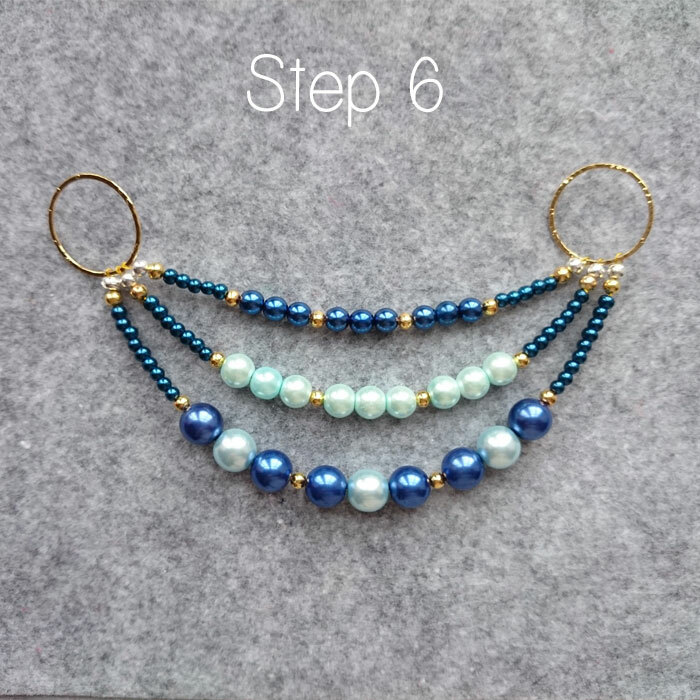 Start with the top row of your pattern and string on your beads in exactly the same order. Thread the tail of the beading wire next to the hammered link through at least one of the beads next to the crimp cover. Then trim the wire as close to the beads as possible, so that you can’t see it. 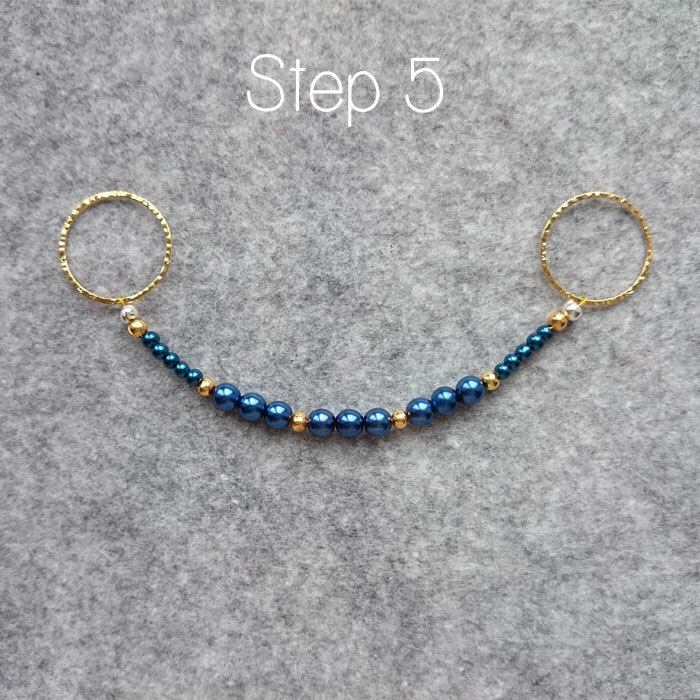 Following the same process as steps 2 and 3, secure your string of beads to the other hammered link, as shown in the step 5 photo. 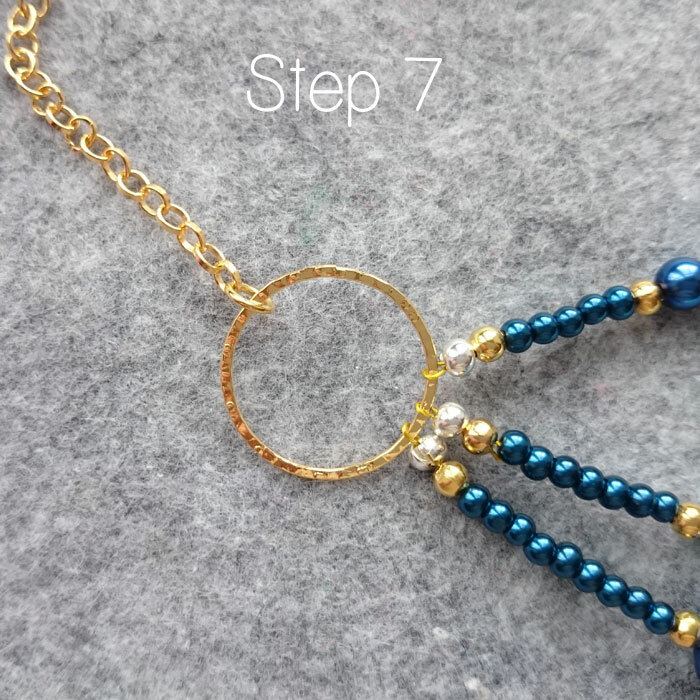 Repeat steps 2 to 5 to make the other two strands for your necklace. 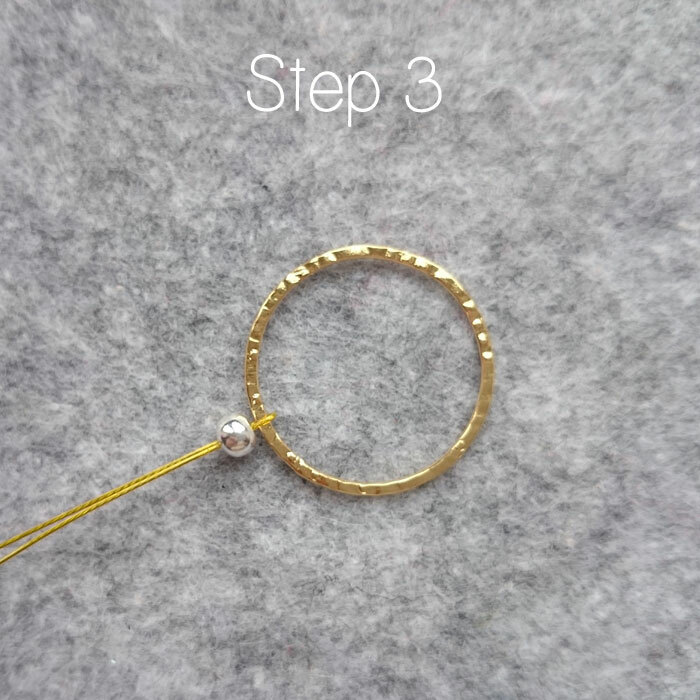 Follow your pattern and string the beads exactly as you’ve laid them out. 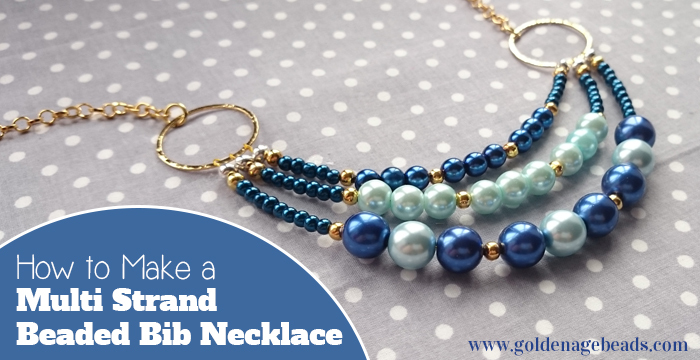 Once your three strands of beads are secured to the hammered links, it’s time to attach the chain. 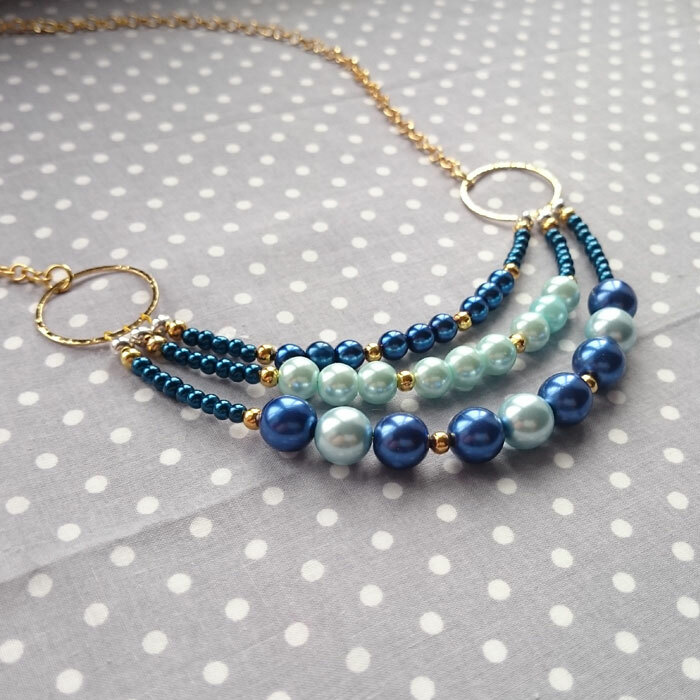 Work out where you want the beaded strands of your necklace to sit below your neck by holding it against you. 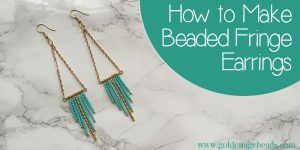 Then measure out how much chain you’ll need by placing it around your neck, from one side of the beaded strands to the other. 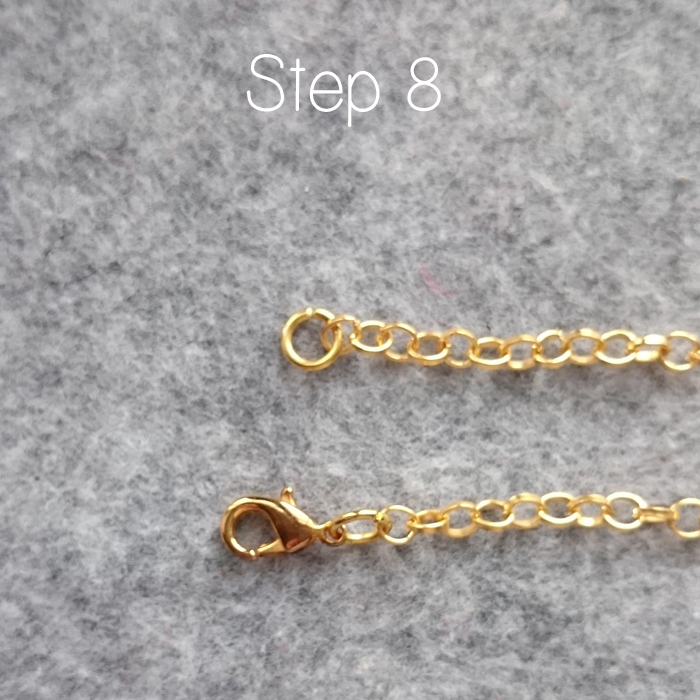 Trim the chain and attach one end of it to one hammered link with a jump ring, as shown in the step 7 photo. Then, do the same on the opposite side. When you’ve done that, measure out the halfway point of the chain and cut with your wire cutters. This is where your clasp will go. Attach the clasp to both ends of your chain as shown. That’s it; your necklace is complete and should look something like the picture below! 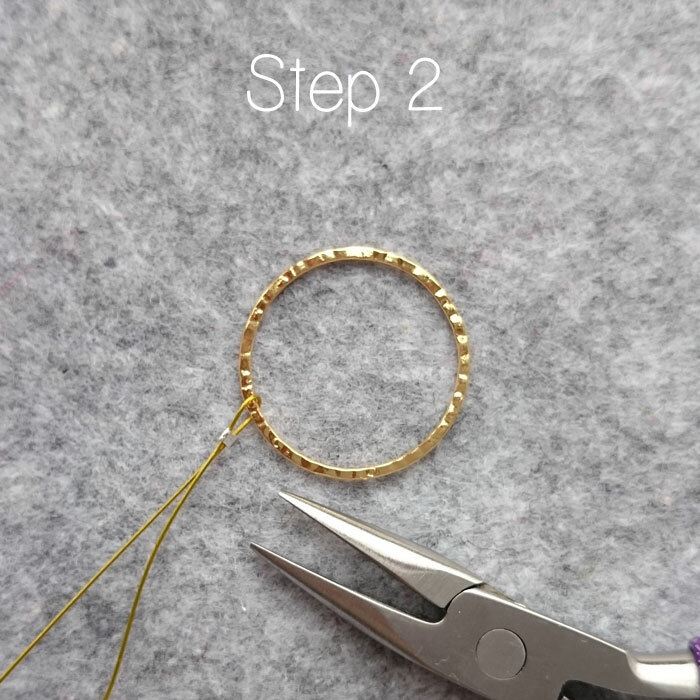 We hope you enjoyed this jewelry-making tutorial. You might want to check out our other free tutorials on our blog here. Did you like this tutorial? Please take a minute to share this online! I love the necklace, it is beautiful. I can picture it in black and white or turquoise with pearls, or substitute gold with either.I will be trying all tree colors as well as the color co-ordination you have pictured. Love the inspiration for this necklace. Thanks, I’LL give it a try. Very easy to make, tha ks for the step by step instructions!!! Thanks for these super easy instructions! You’re a great teacher! I’m going to make this with silver since I don’t yet have enough gold. I’ve just gotten started and this seems like a great necklace to try. Thanks again! Thanks for sharing.. 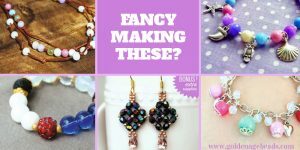 Loved the tutorial easy to make.. Wish me luck going to try and make my first multi strand necklace! This is lovely but how do you keep the multistrands from turning on top of each other and twisting? I always have this problem. I love the way you explain things and all the pics. Makes it so much easier to follow.